If I had a magic wand to make suffocated emotions, plastic waste and tiredness disappear I wouldn’t be writing this post. On pondering 2018 with this month’s A Chronic Voice link up prompts I noticed 3 things I learnt that caused to me consider some new habits. It turns out all 3 of them involve toxins/nutrients cycling though a system. So here they are: In 2018 I learnt about the importance of Establishing,Breaking and Allowing. Although this isn’t new information for me, the importance of it was driven home last year, something so simple and obvious. If I want to have energy to support my husband and look after our energetic, curious children I need to get the right nutrition. We have no garbage truck to whisk away our bread bags and milk cartons since we moved out of town. All our rubbish stays with us in one form or other. If we can’t compost it, or send it out to be recycled we either burn it (breathing in the smoke), or bury it (so it becomes part of the soil that gives us our water and food). Horrifying! Is this a mini version of what’s happening on the whole planet? All the rubbish/trash has to go somewhere. My parents were upcycling before the word was invented, so thinking about the environment and waste is not new. But if my yard and house are filling up with coffee packets and shampoo bottles I’m going to need to pay more attention to moving towards zero waste. A familiar sight caused me to double take while scrolling Facebook. It was a picture of the emotion chart my counsellor gave me that I didn’t know I needed. 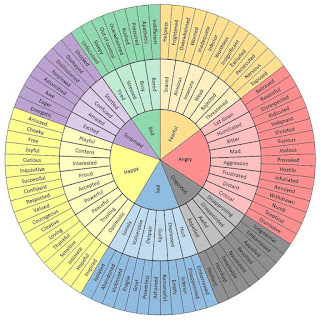 The colour coded wheel starts with general emotions in the centre and fans out into more specific ones (see photo, credit unknown). It helps identify what you are feeling. A long time ago in a country far, far away my husband was sick. His illness was debilitating over a period of two years, but still mostly invisible to doctors and others. Soeun’s health is manageable now. That was a stressful season of life but we have been out of crisis for more than six years. We’re glad it’s over! Invisible emotions can spring from invisible illnesses. So much loss and grief at the time, but it wasn’t allowed or acknowledged. The ubiquitous yard stick of health problems kept appearing “At least he doesn’t have cancer”. Papering over the pain with thankfulness helped me get through each day. When I tried to explain what was happening people reacted as if I had a paper cut on my finger when really it felt like my finger had been hacked off by a blunt axe. It actually felt like my husband was gone and I didn’t know if he was ever coming back. (I’ve since been told losing a spouse is one of the most stressful life events.) But that was too huge to feel and also felt silly to say out loud as the doctors said he was fine, all his tests were normal. And the doctor I went to see about my mental health also said I would be fine in a few months. Plus, Soeun was the one in pain, why was I complaining? On the surface Soeun was just dizzy, and mostly without a diagnosis, medical tests ruled out all the diseases he didn’t have. And he’s pretty much fine now. So what’s the problem? When I’m explaining the circumstances I feel like there is no problem. This is what I see out my window. Even in "winter". Using the emotions chart revealed something unexpected. 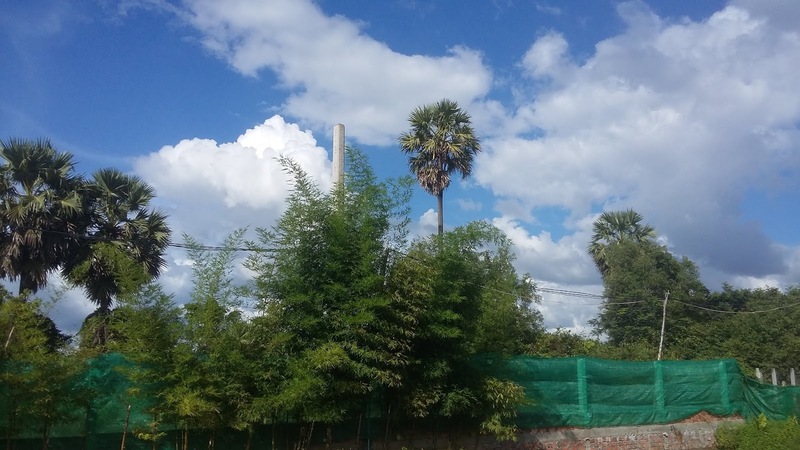 It was like the shock of opening the curtains and seeing the palm trees in tropical Cambodia covered in cold snow. When the counsellor asked me to check off which emotions I felt during that season it revealed huge losses and grief! Unseen losses mean they might be unexpressed for years and may need to be unravelled somewhere down the track. So I don't have a magic wand to deal with the tiredness, trash and tears but potentially I could turn these into new year resolutions. I'm not willing to make such a commitment on the internet though, but it will be interesting to ready this again next January. Another article and video also helped me to keep thinking through "Allowing Emotions". Have a read & watch. It makes so much sense and was so eye opening for me. The mistake I made with my grieving friend on Huff Post. I find your thoughts on garbage very interesting, as I'm so used to them being out of sight, out of mind :( I suppose there are landfill areas for such trash, and in Singapore we incinerate them. But you are right - what goes round comes round. :( I definitely need to do better in that regard. Thanks Sheryl. Yes fun to find another in Asia, and someone who used the same spelling system! Thanks for sharing your emotion wheel. I'm also really good at stuffing emotions. I'm glad you are learning this while you are young. It's not as easy to change our habits the older we get, but I'm working on it. Thanks for the mention Claire!